Students, alumni, and fans cheer at the recent addition of Collegiate beads coupled with an expanded assortment of Sterling Silver Swarovski beads in popular school colors to mix and match to celebrate school spirit. 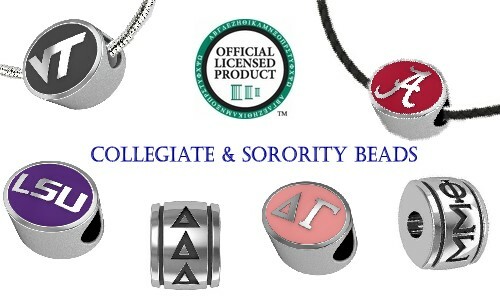 The collection includes more than 70 schools casted in sterling silver. Two-sided design with an application of an antique finish make the logos distinctive and stand out. When only one side of a specific bead is shown, the design for the school is shown. Show your team colors! These beads are compatible with Reflections, Zable, Kera, and other leading brands in the marketplace so go ahead and let the world know you're proud of your school.